Think of Jonathan Vilma and you think of a hard-hitting linebacker who stopped at nothing to get the Hurricanes back to the pinnacle of college football. While the Coral Gables High School product has not been successful at everything he has attempted on and off the field, his many and varied accomplishments make it seem like he has. And without question, helping lead the Hurricanes back to the top of the mountain was one of his finest football accomplishments. A Freshman All-American in 2000, Vilma relished playing the big games and particularly the Florida State Seminoles. As a sophomore, he made 9 tackles and returned a fumble 36 yards as the Canes stopped FSU's 54 game home unbeaten streak, then had his career high of 20 tackles (12 solo) against them in 2002. The Canes were 5-0 against their upstate rival in his four seasons, and compiled an overall record of 46-4, played in four BCS bowl games, and won the 2001 National Championship. Jonathan was named a 2003 All-American by the American Football Coaches Association and the Walter Camp Foundation. That season he led the Canes with 127 total tackles (81 solo) and was a finalist for the Butkus Award as the nation's most outstanding linebacker. 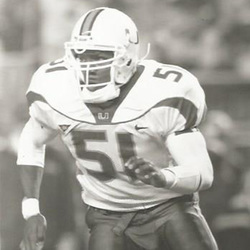 He led the Hurricanes in tackles for three consecutive years (2001-2003) and his 377 career total tackles rank seventh-best all time, fourth-best for a middle linebacker behind only UMSHoF members George Mira, Jr., Micheal Barrow and Ray Lewis. One of the most decorated Hurricanes OFF the field as well, Jonathan is a member of Iron Arrow, the highest honor one can attain at the University. He was a two-time first team Academic All-American, a three-time Academic All-Big East selection, and the 2003 winner of the Walter Kichefski Endowed Football Scholarship, given by the UMSHoF to the player chosen by the coaching staff who best demonstrates respect of fellow man, loyalty, dedication, sacrifice, motivation and inspiration – qualities that Coach Kichefski exemplified in his nearly 60 years at The U. Selected in the first round (12th overall) of the 2004 NFL Draft by the New York Jets, he was named the NFL Defensive Rookie of the Year. That 2004 draft featured an NFL record six Miami Hurricanes taken in the first round (including fellow 2015 UMSHoF inductee Sean Taylor), the most ever by one school. A three-time Pro Bowl selection, he spent 4 seasons with the Jets, then 6 more with the New Orleans Saints, winners of the 2009 Super Bowl in, of all places, Sun Life Stadium. In 2010, Jonathan started the “Jonathan Vilma Foundation” in part to help raise funds to build schools in Haiti following the devastating earthquake that stuck his parents’ homeland. Vilma graduated Miami with a major in Finance and minor in Marketing. Jonathan has a daughter, Samaara.